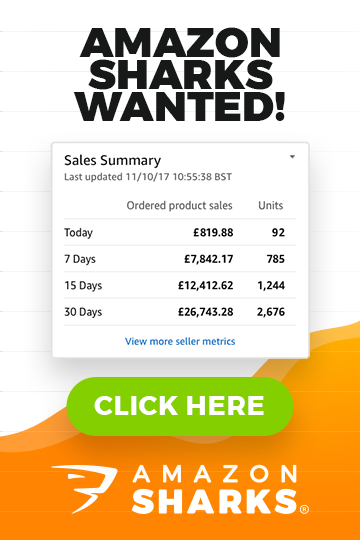 UK Wholesale SCAMS - Smarter than EVER! UK Wholesale SCAMS – Smarter than EVER! I talk a lot about importing from China on this blog, and for a good reason – it really is the best way to go if you’re looking to make real profit selling online (I’m talking about 100%+ mark-ups!). However, importing from China can be a very taunting task for new sellers, even with all my guides and help, and for some people UK wholesalers can be a viable alternative when starting out. Shipping costs are a big consideration when placing wholesale orders, as they can drastically affect your per item cost, but when ordering from a UK based company you don’t have to deal with air or sea freight and it becomes much more viable to place low value orders. As well as shipping being cheaper, it is also much quicker. This makes stock control and planning your inventory significantly easier and it also means you can hold a bigger variety of stock as you don’t need huge volumes of each item. Unlike with mainland China where it is impossible to buy genuine branded goods, you can source such items from official distributors and wholesalers in the UK. Actually getting them to sell to you or being able to make any money from such items is another question entirely though! Generally speaking, scams are not as common for UK based businesses as with Chinese companies. The reason for this is of course extremely obvious – nearly everyone knows that a large proportion of the world’s most popular products are made in China and they think that means you can buy directly from the factories there. 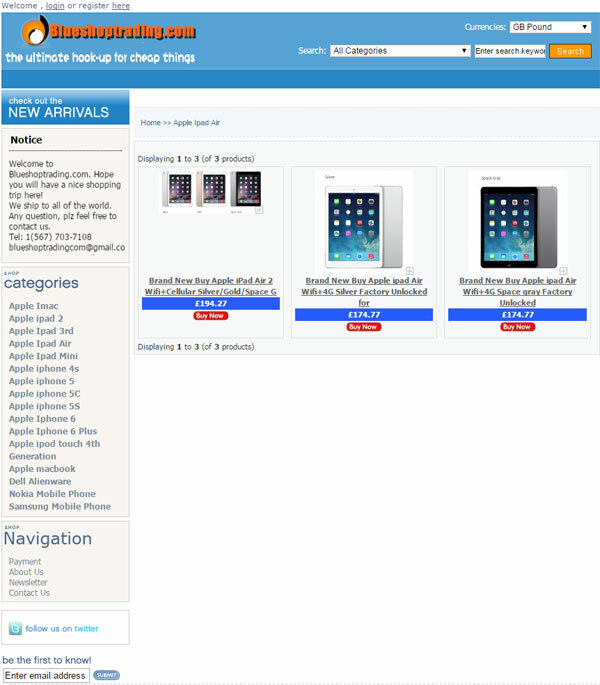 As a result Chinese websites with too good to be true pricing on Apple iPhones and Sony PlayStation 4s are very common. But contrary to what you might have heard, though it is much less likely, you can still get scammed when ordering from UK based businesses! And that’s really what today’s article is all about – a guide on how to properly verify UK based suppliers. First things first, although I’ve mentioned above how you can source branded items from the UK (unlike China where these are 100% no-go items) – they are still the most popular products for scammers and their unbelievable wholesale prices and buy one get one free offers! Luckily for us though, it is a lot easier to verify a UK based business and to uncover any scams using a few simple filters. I can usually spot a scam within seconds of landing on their website. Does this site look genuine to you? No? Haha, what gave it away – the $1 template, awful product pictures or the 50% discount to RRP? I think I’ve said this a thousand times now, but if something seems too good to be true, then it probably is. And this axiom is as valid for UK based suppliers as it is for any other… iPads for £200 and buy one get one free offers on PS4s = SCAM. As simple as that. Another great way to uncover a potential scam is by checking the provided details. Business name, address, telephone number, and company registration number all clearly displayed on the homepage of their website. And that’s exactly what I want to see from a genuine company. And if you want to take it one step further, I’m now going to show you how you can actually verify that information. 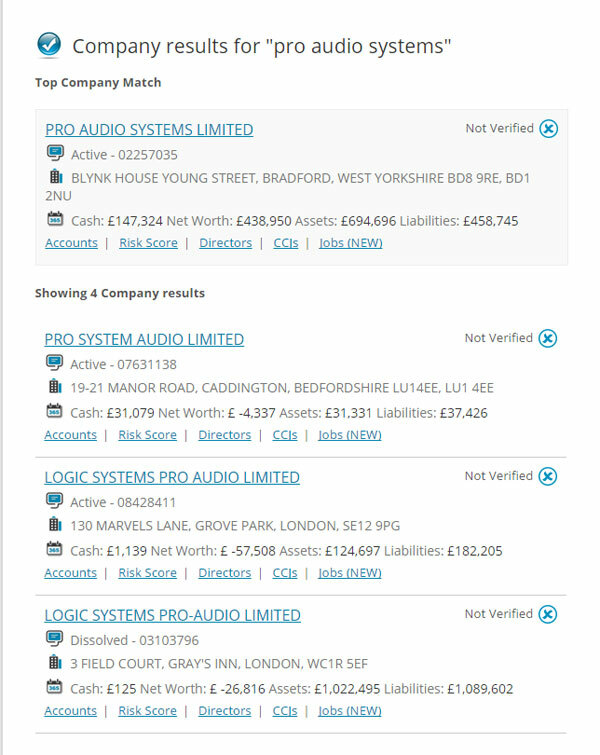 First, head over to companycheck.co.uk – which is a site that allows you to search for a registered company or director. Straight away I can see that the first result is correct – the address is exactly as listed on their site and the company registration number even matches up perfectly. This is a clear indicator that the company is 100% genuine! 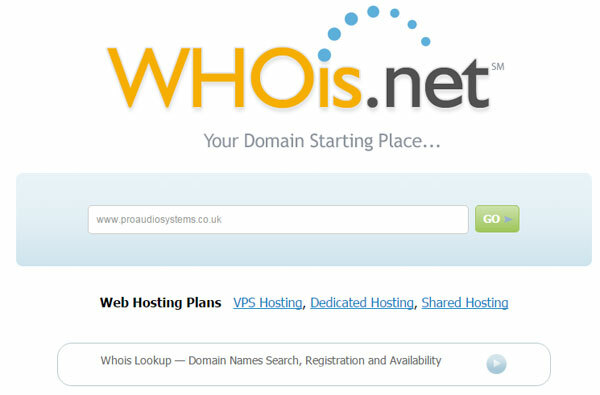 Similar to using companycheck.co.uk, you should also perform a whois search on the domain name at www.whois.net. 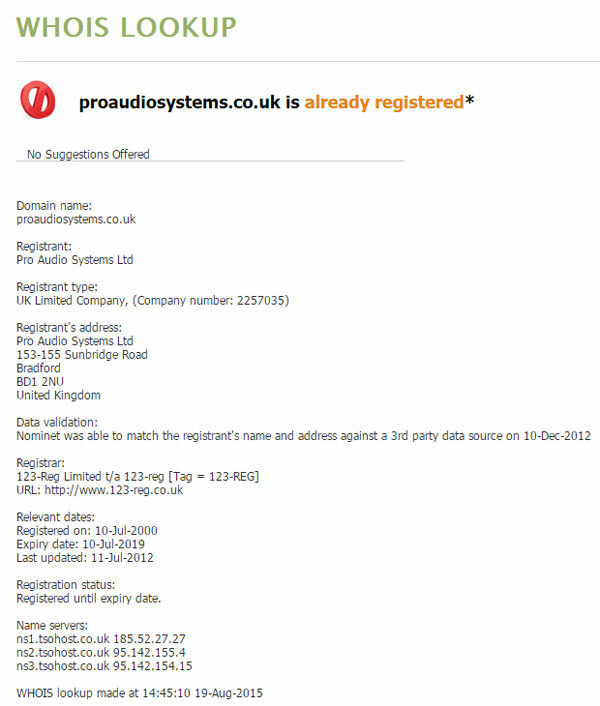 From the results I can see that the domain name is registered to Pro Audio Systems Ltd and while not exactly the same, the registration address is also in Bradford, and lastly the company number also matches so all good here. A tried and trusted scam finder! The payment options I would expect from a UK business are card, bank transfer, and PayPal – bank transfer being the most common as it attracts the least fees. There should be no Western Union and no Money Gram – these are specialist international money transfer services and it doesn’t make any sense to send from the UK to the UK using either of these methods. Shipping methods are a similar story – pallet and courier delivery are to be expected but nothing coming internationally and certainly no China Post or EMS (a Chinese courier company)! Another obvious verification method that is bizarrely underused. As I mentioned above, a UK based company is legally required to have a telephone number displayed on their website, so use it! Call to speak to someone and get a feel for the company. If it’s answered promptly by a receptionist or secretary then it’s most likely a genuine company – if on the other hand it’s answered after two minutes by someone who sounds half asleep then it could well be a single person trying to pull off a scam. Similar to the telephone number verification, you can also look up the listed address on Google Street View. If it’s a small house when it’s supposed to be a large Limited company, then something might be wrong. This is also a great way to gauge the size of the company you are considering dealing with. Again, incredibly simple but still very effective. 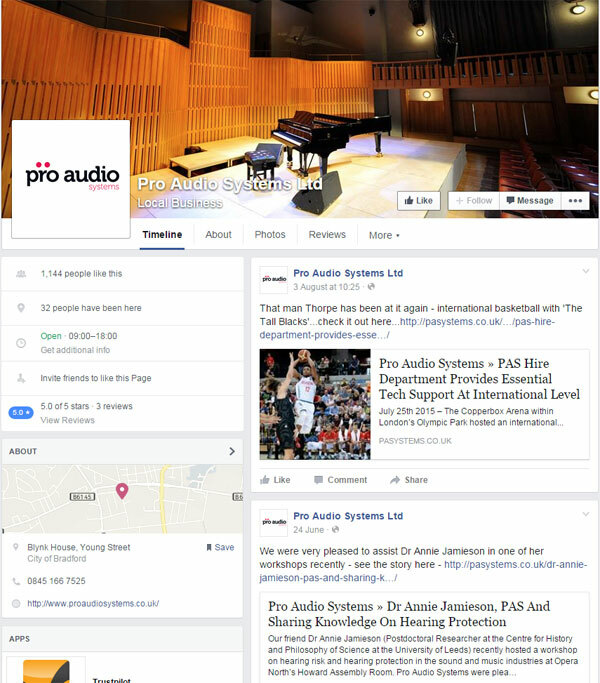 Check the Facebook, Twitter and other social media accounts for that company. Are they active and regularly updated? Are there real people following them? And once again everything looks perfect and as expected! I even saw a few posts about awards and trade events, which is something else I look for as a sign of a genuine company, which brings me perfectly to our 9th and final filter/verification tool. This is a slightly general, miscellaneous point – basically anything that adds to the authenticity of a company, such as attendance at trade shows, any awards, being a member of trade or industry organisations etc. It’s all about using your common sense, as it goes without saying that a scammer isn’t going to take the time to build up all of these credentials. And that’s it! Nine filters, that when used in conjunction with each other make it practically impossible for you to be scammed. I actually do want to point out that the majority of “UK based” scams that you come across will be from companies pretending to be UK based! A slight variation of this trick, that is actually a lot harder to spot, is a European scammer pretending to be a UK company. I’ve actually seen a few such cases where they had genuine UK bank accounts! But they would still never pass our full verification as pricing is off (too good to be true), whois doesn’t match, and most commonly the VAT and company registration details are incorrect. Basically all the things that we’ve covered today. So if you follow my guide you’ll be able to easily flush out these scammers. As always, I do recommend you err on the side of caution, especially if you’re a newbie just starting out. That means always start with a small, trial order to test a supplier and see how it goes. After all, even if they’re not a scammer, that doesn’t guarantee they are a good supplier. This is actually a very important point and I really wish more people would recognise the difference! I get countless emails every week from people who have been “scammed” by their supplier but when I read further into the story it’s clear there is no scam involved – it’s merely a bad supplier. Poor delivery times, bad communication, low product quality – these are all aspects of a bad supplier, but not necessarily a scammer. So please always bear in mind that making sure it’s not a scam is only step one. Finding a good supplier is a whole other story! That pretty much brings today’s post to an end, but before we finish, I do want to repeat that while sourcing from UK based suppliers is an option, I’m still a big fan of importing as that’s where the real money is. In essence you are paying them a huge fee to take care of the import for you and like that you simply won’t be able to compete with the sellers who order direct from China. 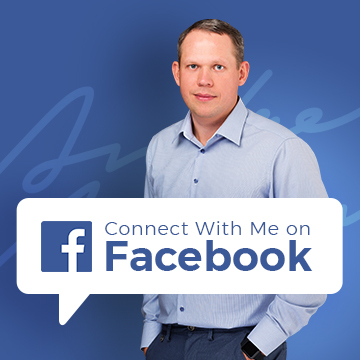 Also, if you want to learn some new sourcing methods, then check out my best selling course Easy Auction Business, in which there is an entire module with more than 3 hours of video dedicated solely to product sourcing. I reveal the 7 best sourcing methods that will allow you to find products that you can sell online and make a real profit! I don’t put my telephone number on my website because I am profoundly deaf, and it doesn’t mean I am a scammer!! Not sure how law implements this though. They are asking for payment of ₹10000 as shipping charges.. then after delivery i have to pay the balance..
No wholesale company will send you goods like this on credit. thankss for the help.. i appriciate your work.. and can u suggest me some wholesellers, from where i can buy phones? There’s no profit in iPhones for small re-sellers and it’s the most popular product amongst scammers. You’ll be lucky to find ANY genuine supplier for them and if you do – prices won’t be competitive at all for online selling.